This book summarizes a Ph.D dissertation carried out at the Water Resources Center of the Jacob Blaustein Institute for Desert Research and Ben Gurion University of the Negev, Israel. The aim of this work was to evaluate the potential recharge in arid rocky watersheds containing bare rock at the upper part of the slope and colluvium/alluvium fills in the lower parts. 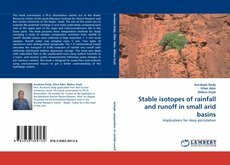 The book presents three independent methods for study including a study of isotopic composition evolution from rainfall to runoff. Rainfall waters were collected in high resolution 1- 2 mm serial samples. Runoff water was sampled every 5 min. Two types of rainstorms were distinguished isotopically. The 1-D mathematical model simulates the transport of δ18O evolution of rainfall into runoff with uniformly distributed shallow depression storage. This book also deals with subsurface flow in the unsaturated zone using sodium bromide as a tracer, and neutron probe measurements following yearly changes in soil moisture content. This book is designed for researchers and students using environmental tracers to get a better understanding of the hydrologic system.